The Good, The Bad and The Innovative. Sometimes lessons can be learnt from totally unrelated fields. Westerns, a personal favourite film genre of mine, can teach us more about innovation and running businesses then you’d initially like to believe. See below for five key points and how they relate to five Westerns. I’ve ranked the films from the most known to most obscure in case you were interested. 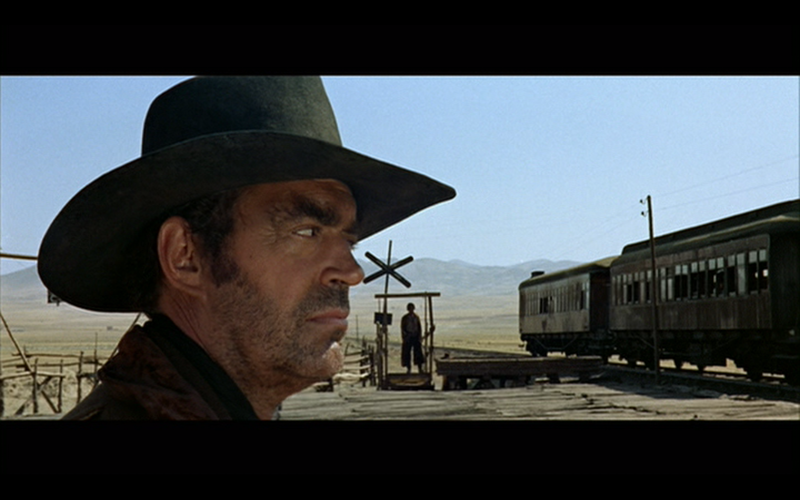 Number 5 – Once Upon A Time in The West (1968) dir. Sergio Leone. Sergio Leone hot off the heels of directing the world’s best American Civil War film (The Good, The Bad and The Ugly) turned his hand to arguably his greatest film, Once Upon A Time in The West. It’s the film that made Henry Fonda play against type as a cold blooded killer. And needless to say, just like all Sergio Leone’s films every shot is breathtaking and filled with knuckle clenching tension. The thing is, by the time OUATITW went into production Sergio Leone had formed a water tight working partnership with Ennio Morricone, arguably one of the greatest film composers of all time. So when you have the best to work with, how does Sergio Leone start his film? With silence. For the first 20 minutes no dialogue is spoken. No music. Nothing but a few sound effects. A match being struck here. A cough there. A sign swinging in the wind. Sometimes even if you have the best talent in the world you should know when is the right time to use it. And that might not be all the time. It is an art knowing when to use your star player/asset. Know when to use your best asset. And this might not be when you think you should use them. Number 4 – Rio Bravo (1959) dir. Howard Hawks. 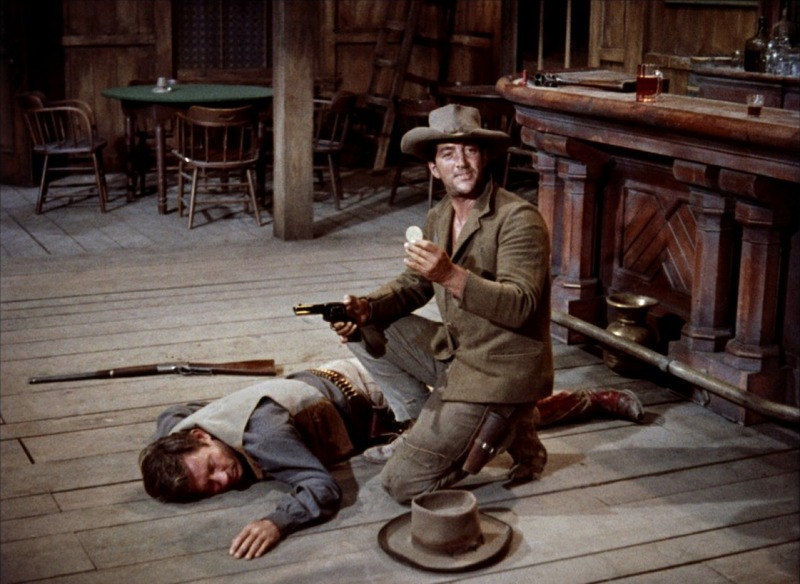 Rio Bravo, is one western that seems to consistently feature on all movie critics’ top ten Western lists. In a small way it was the first ever buddy film (think Lethal Weapon / 48 hours / Rush Hour etc.). It pairs a small town sheriff (John Wayne) with a drunken failure (Dean Martin) and their monumental task of stopping the bad guys from running amok in their small town. Now, I’m not even a fan of this film. I don’t think it’s brilliant. I don’t even think the direction is impressive. If I’m being honest, I tend to get bored in parts. But it is included for a reason. And that reason is a lot of powerful filmmakers list this as their all time favourite film. For example, Quentin Tarantino. Quentin Tarantino uses Rio Bravo as a make or break deal with girls he is thinking of dating. Firstly, he makes them watch it. Then he gets them to critique it. If the potential girlfriend doesn’t like Rio Bravo, they’re history. And he’s not the only admirer. John Carpenter (director of Halloween and The Thing) was another huge fan, to the extent he remade it. ‘Assault on Precinct 13’ was Rio Bravo but shot in a Los Angeles jail. The reason why Rio Bravo is included as a lesson in innovation is this: watch and do the things the people you admire do. Even if you disagree and dislike, it is always a blessing to know and understand the things that make people you look up to, tick. Follow in your heroes’ footsteps. You might not agree with everything they do / like, but you’ll see a lot of truths and insights along the way if you do follow them. Number 3 – Silverado (1985) dir. Lawrence Kasdan. The 80s weren’t the kindest to Westerns. They were seen to be outdated and not with the times. It is interesting to note that some of the biggest hits of the 80s were essentially westerns. They were just set in space. Aliens director James Cameron is quoted as saying Aliens is just a Western but in space. But I’m going off topic. 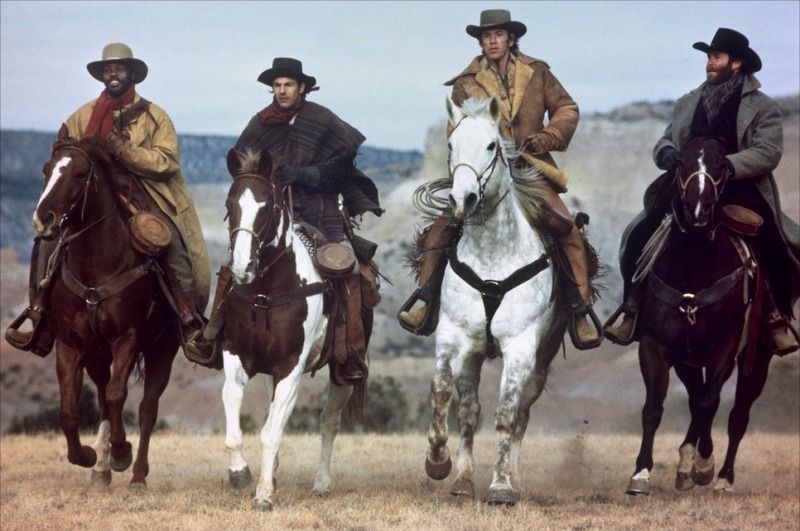 Alongside Pale Rider, Silverado was one of the few great 80s Westerns. Its plot is basically a chance meeting between four cowboys as they venture towards the unknown, a small town called Silverado with a bent Sheriff. Many film critics have used the term ‘ensemble cast’ when describing Silverado. It has Kevin Costner, Danny Glover, Scott Glenn, Kevin Kline, John Cleese, Brian Dennehy, Jeff Goldblum, Linda Hunt. But I’d generally say this is a classic piece of revisionst history. If you look at the time this was filmed, the majority of these stars weren’t stars. Kevin Coastner wasn’t a star, Kevin Kline was doing plays, John Cleese was unknown in the US and certainly not known for drama. Danny Glover hadn’t done Lethal Weapon yet. Jeff Goldblum wasn’t The Fly yet. If anything the only famous actors were Brian Dennehy (from Gorky Park) and Linda Hunt (winning an Oscar for her role in The Year of Living Dangerously – for which she bizarrely played a male… first awarded transgender Oscar by the way). The thing is, Silverado had an ensemble cast before the cast could be called an ensemble (read: famous). If you were handing out Oscars to casting agents, then Wallis Nicita (the casting agent) would have won hands down. What Silverado teaches me is you should be actively looking and grooming what could be the next big thing. Looking at what has gone before isn’t the brave path you should take if you want to create something truly amazing. Never be afraid to look to the future and the potential in people / things that aren’t big yet, but might be one day soon. Number 2 – Utu (1985) dir. Geoff Murphy. 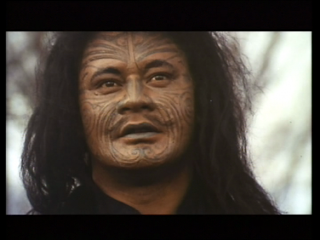 Forget about Once Were Warriors and The Piano, Utu is at least in my humble opinion the best New Zealand fim made. And it is a western. It tells the tale of revenge between both a Maori chief, Te Wheke, and a colonial man, Williamson. Basically Te Wheke’s life is thrown into a state of flux when he loses everything and goes on a rampage. Like ‘Falling Down’ but with an adrenaline boost and a taste for blood thrown in. Along the way Williamson’s (played by the only one of his kind, Bruno Lawrence) life is thrown into the same state of flux when he loses everything (wife, family, possessions) in one of Te Wheke’s murderous revenge sprees. Williamson then feels the only action is to take revenge against Te Wheke. The great thing about this film is that it plays with your own mind of what a genre is and what it isn’t. We all assume that the Western genre is cowboys in America in the 19th century, Even the Spaghetti Westerns of the 60s emulated this rather than trying to create an Italian take on this genre. What’s interesting is that here is a New Zealand Western set in the 1860s in New Zealand, with New Zealand actors and yet very much a Western. Westerns up until that point for me had a set defined list of things. With Utu, it made me reconsider what exactly constitutes the Western genre. The lesson here is that even though you think you have a fixed set of parameters sometimes you have to re-look at the situation and problems and break those boundaries. Only then can you create a fresh set of thinking with new solutions that make complete sense but in a completely different way. Lesson: Look at problems and situations from a distance to see if they can be seen in a completely different and fresh way. 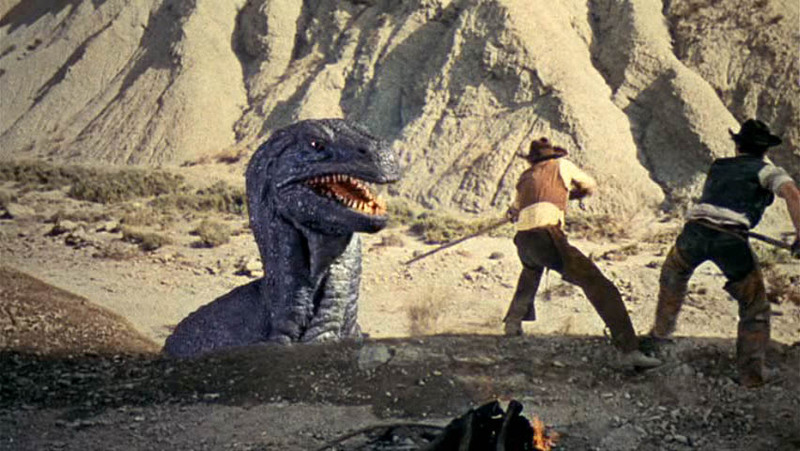 Number 1 – The Valley of Gwangi (1969) dir. Jim O’Connolly. First of all congratulations if you’ve managed to read this far. I realise this is a long post. The Valley of Gwangi was the first (and last I believe) film to have cowboys and dinosaurs inhabiting the same space. It was also one of Ray Harryhausen’s last films (the magician behind such films as Jason and the Argonauts and countless other stop frame masterpieces). The plot is in many ways a retelling of King Kong… In this updated version, cowboys travel to a strange valley to bring back a dinosaur from which they can show to the interested public and make money off it. It’s the age old story of commerce vs. morality and I don’t need to tell you which one wins. As you can tell just by its plot, the film bombed and was largely forgotten by all aside from the most avid of B-film cinema buffs. The reason why this film is included is that there is one scene (a dinosaur chasing people who at the last possible second is eaten by a T-Rex approaching from the side and out of camera view) that was reused in another dinosaur film, this time with a fraction more success. As you have probably guessed it, the scene was reshot frame for frame, and used in Jurassic Park. I guess what I learn from this is that even the worst abominations of films can create wonderful bi-products. Lesson: Not all complete failures are complete failures. Sometimes great successes can flower from them.